My birthday dinner this year was a surprise. I suppose in many ways surprises are a test as to how well someone knows you. When my boyfriend Brent arrived at my house to pick me up for dinner I still hadn't guessed, and skirted the clues, after all I really am someone who thoroughly enjoys a good surprise. When we turned onto Fairfax my heart pattered. Could it be? "Animal..." I murmured, with a knowing smile. Ah, he DEFINITELY knows me. Though Jon Shook & Vinny Dotolo's meatlover's hideaway has quietly been winning over LA since 2008 with pig ears and poutine I still, somehow, had never been. Alas, I must have lamented aloud at least once. I punched Brent in the arm. Inside the unmarked storefront on Fairfax, a strip of Miracle Mile best known for Canter's and the Silent Movie Theatre, a bustling crowd of theatre-goers, young professionals, and hip couples crossed forks in Animal's spare, unpretentious space. 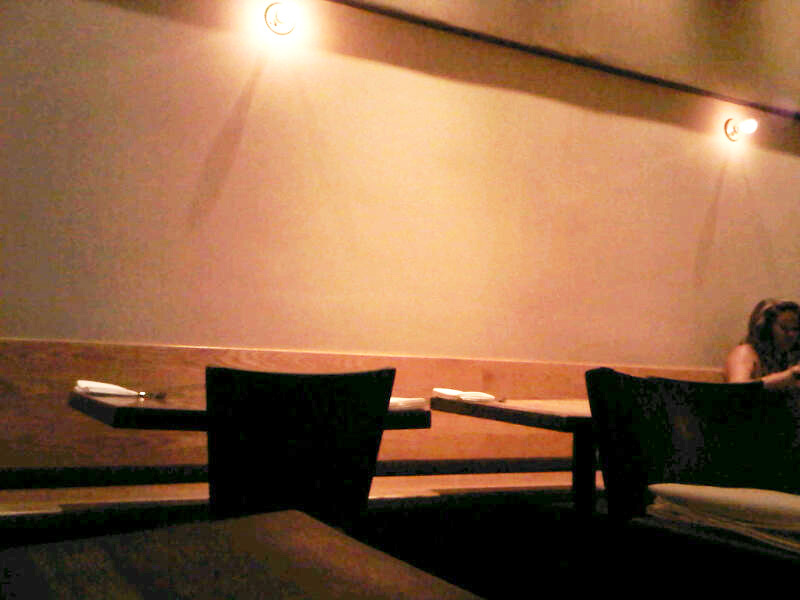 We were seated near the wine bar at a small wooden table and handed the daily menu. No frills here, it's all about the food. 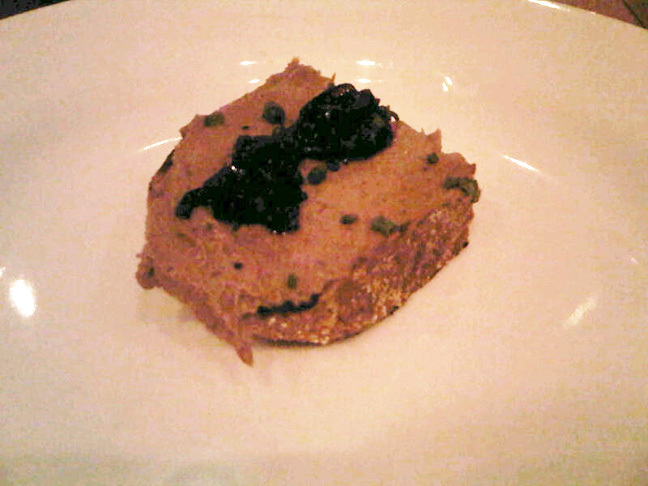 We started with an amuse bouche supreme of sorts, the rich and delicious chicken liver toast with tart balsamic shallot jam. Clears up any confusion that you will be indulging this evening right off the bat. 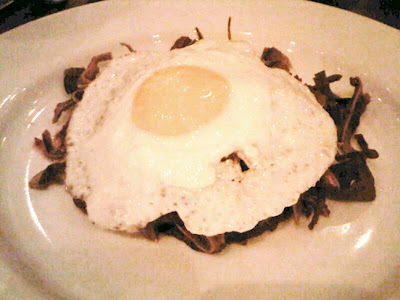 And so we dove right into the ribboned pig ear next, gussied up with chili, lime, and a fried egg up top. The crunchy, spicy pig ear strips reminded me of melt-in-your-mouth super crisp lean bacon, but better. A revelation! 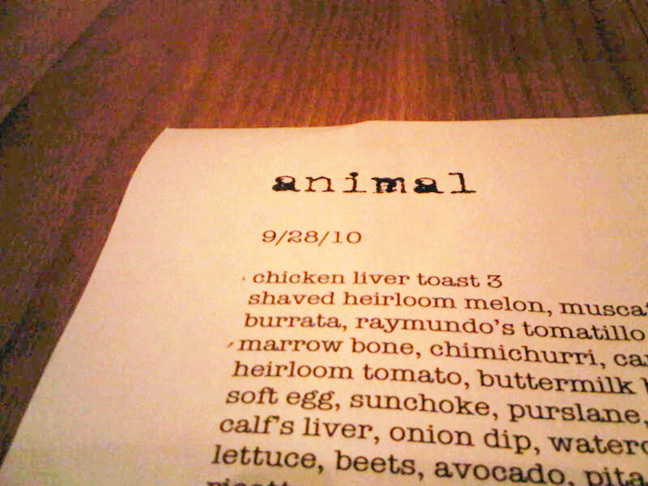 Menus like Animal's push the envelope enough that if you aren't trying something new you're either a card carrying gourmand or a chicken. I'm no chicken, so ordered the marrow bone. 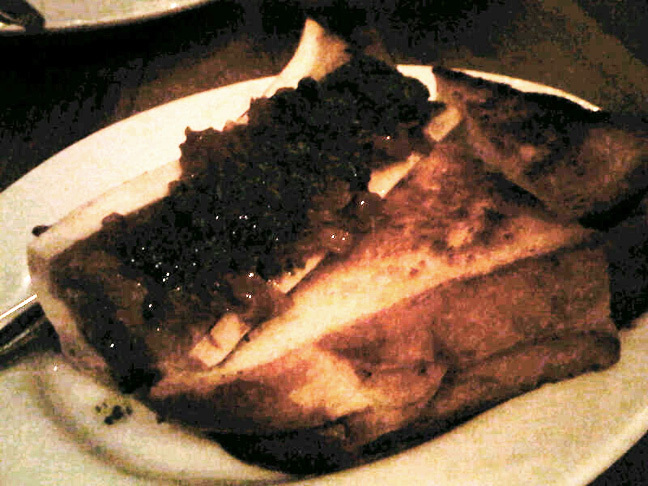 I've never had marrow served in the bone, and despite its raw appearance, piled with chimichurri and caramelized onions, the heavenly scent won me over even before the first bite. Spread on a slice of warm fluffy Texas toast, this was easily the most sinfully exorbitant course. When the barbeque pork belly sandwiches came, Brent and I just stared at each other, knowing we had an entree coming even AFTER this. And we were already full. 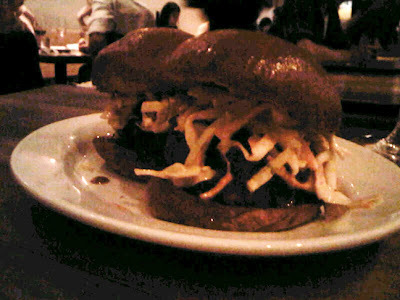 Still, we dug into our mondo sliders, stacked with slaw and dripping with tangy sauce. I could feel my eyes bug, make note: these sandwiches are incredible. I whimpered a little when the flat iron steak arrived. But slowly lifted my knife. It was my birthday damn it and I was going to be rolled home if necessary. 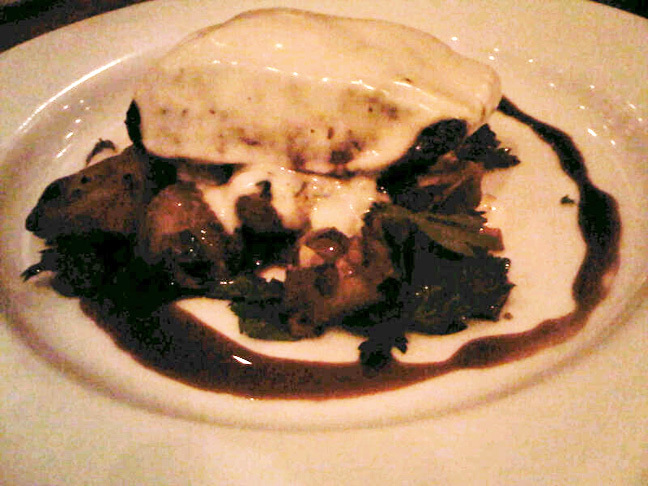 The gooey truffle parmesan fondue covering the steak was another fragrant warrior, buttressed with a subtle artichoke hash. Juicy, perfect, umami perfection. Another incredible dish I wished I had more room to enjoy to its flagrant fullest. The irony is that we ordered dessert. 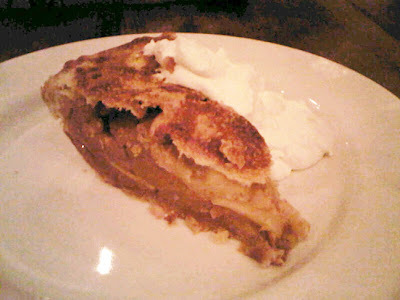 There was one slice of apple pie left and it was near closing time, they needed our help. The crusty home-style pie was just like ma used to make. Nothing fancy, just plain good. I rubbed my belly all the way back to the car, wishing I lived close enough to walk home. But I still can't imagine a better way to celebrate a mellow weeknight birthday than with a table for two, a bottle of wine, and a feast fit for a king. Happy belated birthday, Mr. ChocoMeat! 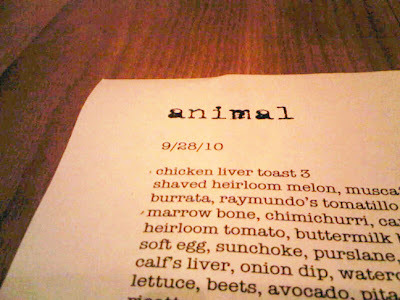 You and Brent whooped it up nicely :-) I've eaten at Animal, but haven't tried the pigs ears. One of many, many reasons to return for another meal! Thanks you two. PIG EARS!!!!! My arteries ache for you both but sounds like a nice birthday!